Create a list of features and amenities you prefer to be included in your dream home. the presence of special rooms or sections such as a balcony/veranda/porch, basement, garage, attic, lawn, bathroom tub, pool, etc. Decide whether to buy a property personally or through a real estate agent/agency. Choosing the latter will make it easier. You just have to provide documents and all other information needed by the agent or agency. There is a corresponding fee associated with real estate representatives though. The same applies with buying properties which are entrusted upon agents and agencies. So if you’d like to avoid paying such fees and commission, you are better off personally handling everything needed to purchase a property and directly dealing with the actual owner of homes for sale you are interested with. Find options to search for properties for sale. This obviously applies if you are buying on your own without the help of any mediator. Options include both online and offline sources. Over the web, you may search through MLS services, classifieds, real estate directories, local business listings, and even social media pages. Offline, there are print ads, newspaper or magazine classifieds, local city billboards, open house events, and even referrals from friends, family and everyone else. Narrow down the list of prospects. You may refer to the classifications listed on the first step to be able to narrow down your options; in case the list of prospective properties is long. 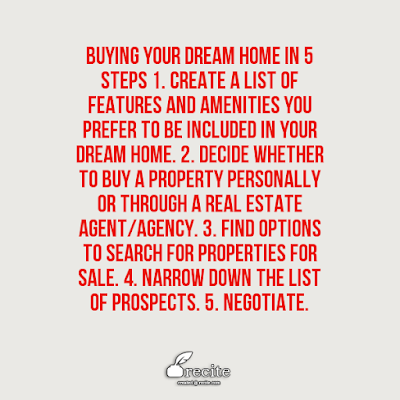 You can also weed out the list by contacting the home owners or their representatives; crossing out those who don’t reply. You can further filter the list through careful personal inspection of the properties. Like all other products and services, you can get the most by negotiating. It’s easy to spot sellers who have no intention of selling when they list ridiculously high prices and are not willing to compromise. The easiest sell on the other hand are from owners who are in dire need for cash or are relocating soon. Not that you want to take advantage of such circumstances; think of it as an opportunity to get the best value for your money. Congratulations! You now have your dream home! In relation to #2, you may contact Dameri and Trexler, when in need of an El Dorado Hills real estate agency.